Enjoy maintenance free living in this gated community with community pool! This spacious townhome features three bedrooms, a loft, two and a half baths and boasts 1769 square feet of living space. Corner unit with covered front entryway and a two car attached garage. Enjoy the welcoming open floor plan on the first level. Kitchen features recessed lighting, 42” cabinets, all appliances and a breakfast bar overlooking the great room. The dining room opens to a screened porch which backs to green space and offers 2 privacy fences. Half bath on the first level, all bedrooms on the second level. The oversized master bedroom offers a tray ceiling, large walk in closet and a bathroom with tub and separate shower with upgraded tiles and double vanity. Near to schools, shopping and dining. Minutes to Florida Turnpike making easy access to all area attractions. 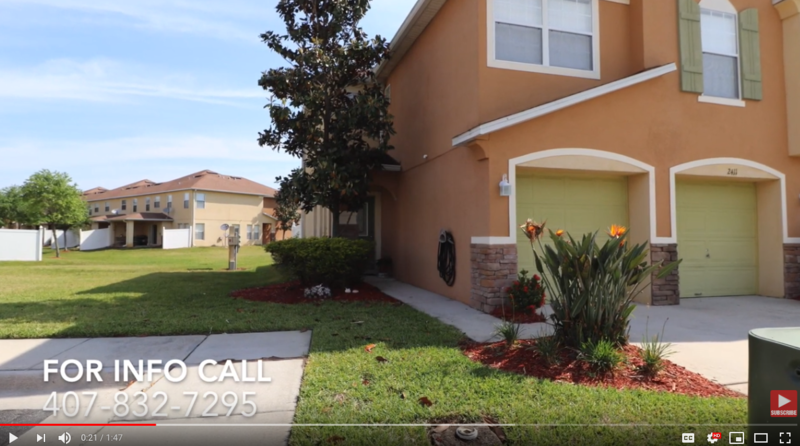 Near to Kissimmee’s Lakefront Park offering the spectacular beauty of nature, numerous outdoor activities, fishing pier, boat ramp, picnic tables, playground and volleyball court.